The Snowshoe is a fairly recent addition to the cat family. A kitten that had four white feet was found in a litter of purebred Siamese kittens and this was the beginning of the Snowshoe as we know it today. 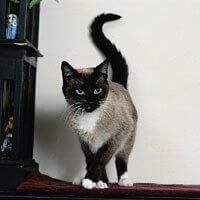 Many breeders agree that it does share its past with both the Siamese and the Birman breeds, however today's Snowshoe is a completely different animal. The first attempt at establishing a breed of moderate, white-footed Siamese cats began in the 1950s under the name of Silver Laces. Its history was short-lived and nothing was done until the 1960s when Dorothy Hinds-Daugherty, a Philadelphia Siamese breeder, decided to develop a moderate, white-footed, Siamese-typed cat into a breed she christened the Snowshoe. With the advent of more breeders and more work on the standards, the Snowshoe breed became recognised as a permanent breed in 1982. Today, the Snowshoe is a moderate cat in everything, but its markings. The pattern is recessive genetically and so rigid requirements must be upheld to maintain and accentuate the proper markings. It is not just a Siamese with white. The body type is a moderate oriental or foreign type and was modelled from the appearance of earlier Siamese cats. The eyes are the only extreme on the cat and they should be walnut shaped (larger and more rounded than the eye of the Siamese, but not as round as the eye of a Persian) and as bright and as blue as possible. These wonderful creatures make champion pets. They are active and "full of beans" and want to be with you at all times, and so they would prefer to curl up in a warm lap rather than the rest on the best of cat beds. They are sometimes shy with strangers and do not take to too many changes, but they are extremely devoted to family members including other family pets. They are highly intelligent and can easily be taught games and basic training is a snap for them. So if you want a cat that wants to get down to the serious business of fun, then the Snowshoe cat is for you.